What follows is a technical article around the Zombiecorp concept of home-brewed hacked sound devices, and a set of basic guidelines on how to proceed hacking successfully building them to obtain curious residual sound or video signals. They can be thought of as wild digital semi-random oscillators. Inside alarm clocks, tapeplayers, photo cameras, computers, video boards, in fact inside most of electronic devices there’s a lot going on while they operate. All kinds of signals are crossing the boards and noise is all over the place. This text focuses on this digital boards we find inside them. The kind of boards that are thrown in the rubbish. I call them the Zombies, since they’re dead circuitry, discarded boards, or just pieces of other devices. And why not a corporation since there’s an army of them. They’re produced by the millions of millions, and thrown away really quickly, most of them working. It might come the day when machines re-assemble themselves, replacing parts of they’re system on their own. Arquitectures of discarded pieces looking for bits they can use. Without being machines, we can as well put together bits to build arquitectures of dead circuitry. Connect the ground of an audio jack to the ground of the board. Solder the negative leg of a 22uf (can be any value but lower values will filter the low frequencies) capacitor in series to the hot terminal, with the positive leg connected to a probe. We do this to protect the speakers, as we’re blocking any dc voltage that might be present in the points of the board we’re investigating. Most boards have an internal clock that determines the frequency at which they operate. 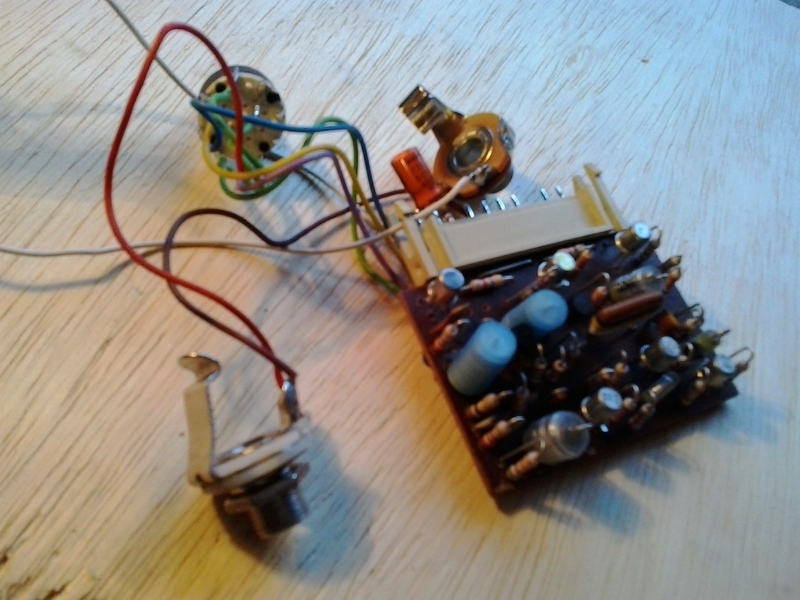 Most often a crystal oscillator is the key component. They can be quite expensive but there’s tons of them in the zombies. Always one, at least, for each board. Replacing the crystal for another one via a switch, for example, will provide different fixed pitches for the sounds. Imagine how a board that’s running at 33.000Mhz sounds with a crystal of 4Mhz. There’s of course limits and some extreme values can make the circuit crash. To be able to sweep continuously the pitch of a board, a high-speed precision oscillator needs to be built. There are a few ways around it but a very good solution is to use the LTC 1799 circuit, which is well known in the bending community, used for hacking Speak&Spells. Because the LTC 1799 is a SMD component, an adapter needs to be built in order to be easily soldered in a circuit, with a little bit of perfboard and some connectors you can then use a socket to install it. Google “LTC 1799 clock substitution” and you’ll find some useful links that explain very well how to perform the mod. Right, so we got drones, pitch-adjustable residual textures of the most varied kind, what else can we do? A quick exploration will reveal that pressing switches in cameras, or adjusting zooms or programming an alarm clock make the most dramatic changes in sound, often very harsh noise will erupt. This switches are connecting points either to ground or to 5v. Investigating the board by connecting points to ground or 5v will show variations and routine changes.Changing voltages in the input pins of chips will change the signals in the outputs. RAMs and ROMs are very rich. If we replicate via switches or sequence this changes via oscillators, we can begin to start controlling the zombie. Build a simple oscillator (running on the same supply), or a set of them and supply their outputs to pins of chips, cut the traces that were arriving to the useful pins and install a switch to alternate the input. Often this boards perform routines and change their behaviour, sometimes they will loop, others they will shut up and come alive later. We are building a wild complex digital oscillator we hope to be able to ride. We have been writing about sound and noise in boards, but there are boards that have video outputs, other that move motors, or display messages. The possibilities of expanding the capabilities of the Zombie corporation are very wide. Having this enormous amount of electronic waste at our disposal, it’s not difficult to think how to build dedicated complex arquitectures made completely of thrown-away zero-cost electronic waste. Sound devices using boards as clocks, other boards as noise oscillators, and other ones as effects or filters. Actual synthesisers, or video synths. At this point obvious, it implies that we’re dealing with systems that adapt their outputs according to their inputs, within or beside other systems that adapt their outputs to their inputs. Meaning that a system might not finish within a board, and might contain subsystems with subsystems in them. We don’t need to comprehend the complexity of this multisystem of systems within systems, or what it did when it was “alive” and working, we just need to connect inputs with outputs and see what happens. When the possibilities of a board finish, we can connect another one to enhance its functions or complement them. …It won’t be long till the boards and circuits people throw, will reorganise themselves to exist as zombies. A passive Zombie taken from a television, that destroys audio.